In this powerful and original collection, Pierre Nepveu, one of Quebec's foremost poets, recreates the tragic circumstances surrounding the construction of Montreal's Mirabel airport. In an exceptional English translation that is wrenching in the shifting sadness of its lines, these poems are brilliantly disturbing, ambitious in their moral force, and universal in scope. 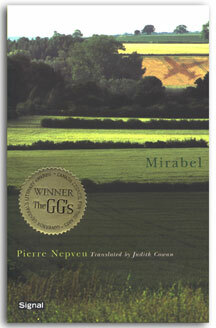 Mirabel [under its original title, Lignes aériennes] won the Governor-General's Award and the International Poetry Festival's Grand Prize in 2003, and has already been hailed as a contemporary masterpiece of French-Canadian poetry. Pierre Nepveu is a Montreal critic, essayist, poet and teacher. He has received the Governor General's Award three times-in 1997 for the collection of poems Romans-fleuves, in 1998 for the essay Intérieurs du Nouveau Monde, and in 2003 for Lignes Aériennes. His many other awards include the Québec-Paris Prize, the Prix Victor-Barbeau de l'Académie des lettres du Québec, and the Canada-Swiss Prize. Pierre Nepveu has taught in the Département d'études françaises at the Université de Montréal since 1978. Judith Cowan has translated several Quebec poets, including Gérald Godin, Yves Préfontaine and Yves Boisvert. She lives in Trois-Rivières.